In an age of cinematic super heroes and role-playing games, who hasn’t imagined themselves at one time in their life as something other than what they were? The seventeenth-century Dutch artist Rembrandt van Rijn certainly did. In his 1636 etching, Self-Portrait with Saskia, both he and his wife are shown wearing historical clothing. Rembrandt wears a fanciful 16th-century style plumed beret tilted at a jaunty angle and a fur-trimmed overcoat, while Saskia wears an old-fashioned veil. Such play-acting was not unusual for Rembrandt who only twice represented himself in the manner that was most popular at the time, as a contemporary Amsterdam gentleman. Whether painting, etching or drawing, Rembrandt, who produced more self-portraits than any artist before him (roughly 75), preferred to show himself in a variety of different imagined roles. You can see him as a soldier in old-fashioned armor, a ragged beggar, a stylish Renaissance courtier, an exotically clad Oriental leader and even Saint Paul. 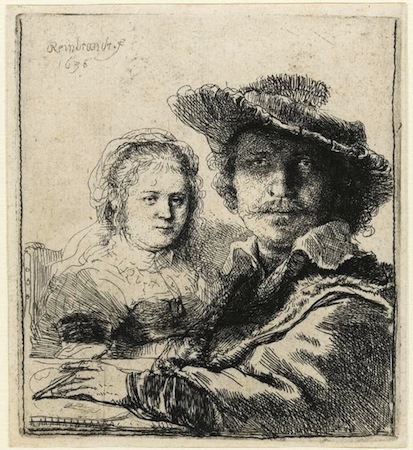 In addition to serving as one of many self-portraits, this small etching can also be regarded as an example of a marriage portrait. The young woman shown seated at the table with the 30 year old Rembrandt is his wife, Saskia van Uylenburgh. Rembrandt most likely met Saskia while working for her cousin, Hendrick Uylenburgh, an art dealer who had a workshop in Amsterdam. The two married on June 22, 1634 and remained together for thirteen years until Saskia’s untimely death at the age of 30. Surprisingly, it is the only etching that Rembrandt ever made of Saskia and himself together. The two figures are presented in half-length, seated around a table before a plain background. Rembrandt dominates the image as he engages the viewer with a serious expression. The brim of his hat casts a dark shadow over his eyes, which adds an air of mystery to his countenance. Saskia, rendered on a smaller scale and appearing rather self-absorbed, sits behind him. It’s almost as if we have interrupted the couple as they enjoy a quiet moment in their daily life. Rembrandt, however, has transformed the traditional marriage portrait into something more inventive. This etching marks the first time that Rembrandt has presented himself as an artist at work. In his left hand he holds a porte-crayon (a two-ended chalk holder) and appears to have been drawing on the sheet of paper before him. By identifying himself as a draftsman, Rembrandt draws attention to his mastery of what was regarded as the most important basic skill of an artist. Is he drawing Saskia or is she simply there to support and inspire her husband as he works? While the marks on his paper don’t provide conclusive evidence of his subject, it certainly was not unusual for Rembrandt to use his wife as a model. In the years that they were married, she would sit for her husband on numerous occasions. Etching is a printmaking process in which a metal plate (usually copper) is coated with a waxy, acid-resistant material. The artist draws through this ground with an etching needle to expose the metal. The plate is then dipped in acid, which “bites” into the exposed metal leaving behind lines in the plate. By controlling the amount of time the acid stays on the plate, the artist can make shallow, fine lines or deep, heavy ones. After the coating is removed, the plate is inked then put through a high-pressure printing press together with a sheet of paper to make the print. Typically, an artist can produce about 100 excellent impressions from a single plate. Rembrandt is regarded as the greatest practitioner of etching in the history of art and the first to popularize this technique as a major form of artistic expression. His work in this medium spans nearly his entire career with nearly 300 etchings to his name. We see a lot of variety in these works as he renders all manner of subjects popular at the time including history, landscapes, still life, nudes, and everyday life, in addition to portraits. 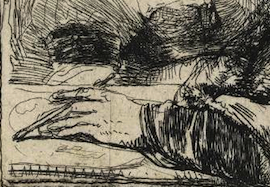 Typically, Rembrandt used a soft ground that would allow him to “draw” freely on his plate (most early etchers used a hard ground), and many of his early etchings have the immediacy and spontaneity of a rapid sketch. In fact, most evidence suggests that he worked directly on the plate, most likely with a preparatory drawing in front of him to serve as a guide. As with his painted works, he developed a very individualized style that clearly set him apart from his contemporaries. His highly experimental nature led him to explore the effects of using different types, weights, and colors of paper for printing his works. Rembrandt is also known for his practice of varying the degree to which he etched a plate, an approach seen here. The figure of Rembrandt is more deeply bitten than that of Saskia, a technique that not only suggests that the artist is closer to us, but also places greater emphasis on him. The figure of Saskia, on the other hand, is more lightly etched, with the effect that she is seated farther away and plays a less important role. 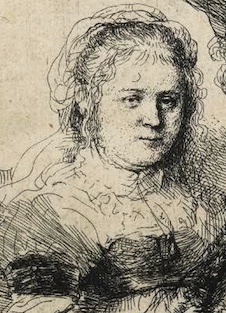 These differences have led some to suggest that Rembrandt may have etched Saskia first, and then added himself in the front. This notion is supported by the lines of her dress which appear to continue under his overcoat. Another thing that makes Rembrandt stand out among his contemporaries is that he often created multiple states of a single image. This etching, for example, exists in three states. By reworking his plates he was able to experiment with ways to improve and extend the expressive power of his images. Cite this page as: Dr. Wendy Schaller, "Rembrandt, Self-Portrait with Saskia," in Smarthistory, August 8, 2015, accessed April 24, 2019, https://smarthistory.org/rembrandt-self-portrait-with-saskia/.